Almost in the shape of a silver fern, a piece of kelp lies on the golden sand of the beach in Titirangi Bay in the Marlborough Sounds of New Zealand. Titirangi Bay features a remote sandy beach with beautiful vistas of islands and forest clad hills, situated in the pristine Marlborough Sounds region of New Zealand. This picture shows a piece of kelp washed up along the golden shores of Titirangi Bay. Titirangi Bay, Marlborough, South Island, New Zealand. 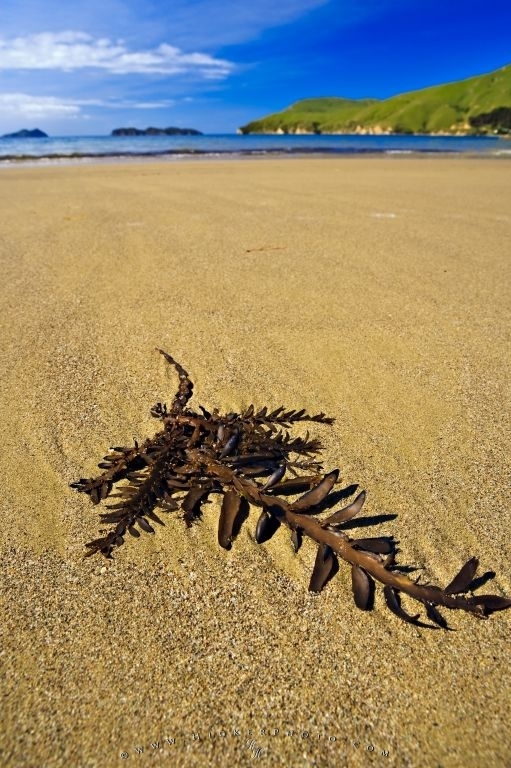 Photo of dry kelp washed up along the beach at Titirangi Bay in the Marlborough Sounds, New Zealand. Pictures from photo gallery "Marlborough Pictures"
This picture is part of the photo album "Marlborough Pictures" - there are more beautiful images waiting for you.